Bacon Pancakes - The Ultimate Easy Breakfast Recipe - VIDEO!!! 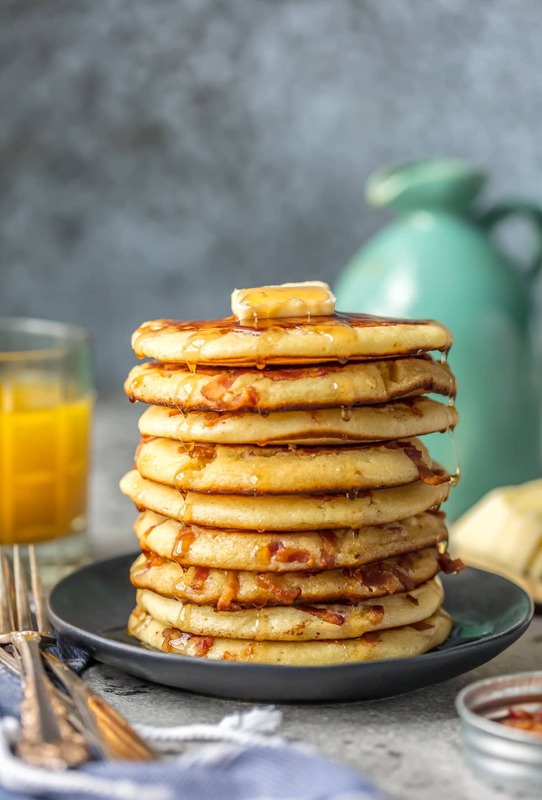 BACON PANCAKES have been a family favorite for years! We first had these savory pancakes and bacon bits at the Calgary Stampede in Canada and have been making them ever since. If you’ve been thinking about making Bacon Pancakes, today is the day! It’s our favorite easy breakfast recipe. The savory/sweet combo just can’t be beat! 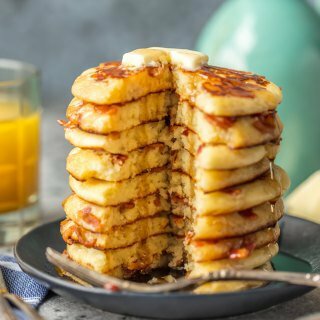 Bacon Pancakes are the perfect combination of my two favorite childhood breakfast recipes, BACON and PANCAKES! Savory and sweet can’t be beat! Bacon Pancakes take me back to childhood. When I was in elementary school, our family went on a 5 week RV trip through the US and Canada (Yes…5 WEEKS) to attend the National Barbershop Quartet Convention in Calgary, Alberta. That pretty much tells you all you need to know about my family…I grew up knowing more Barbershop music than pop music :). It was an incredible trip and we got to see so much of the country…such a dream for any kid. One of my favorite memories from the trip was attending the Calgary Stampede Rodeo in Canada…SO FUN! Our favorite rodeo food was at little street popups…Stampede Cakes! They were simple pancakes with bacon bits inside. My mom has been making them for us ever since, and it’s still one of my favorite easy breakfasts. We originally posted this recipe back when the blog first started all the way back in 2012, so I thought it was about time for a reboot! These BACON PANCAKES deserve to be royally famous! 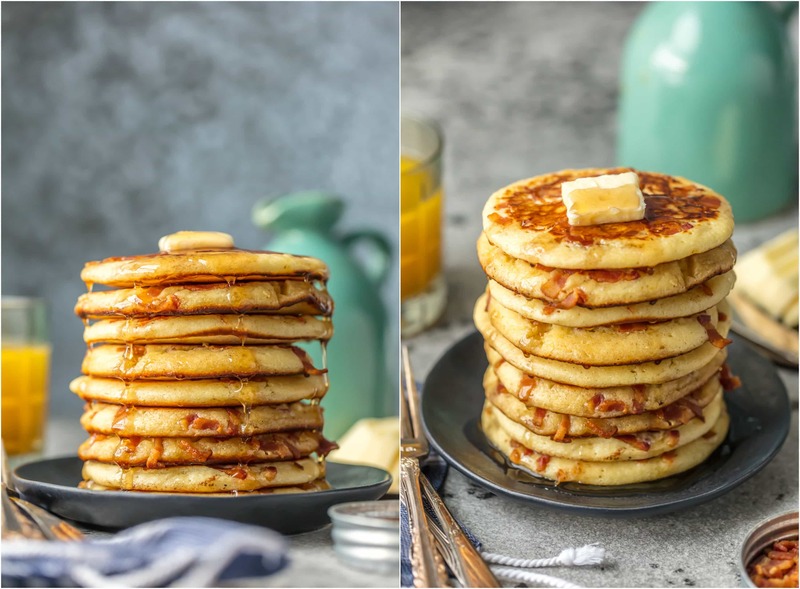 This Bacon Pancakes Recipe has been requested in our home more times than I can count! My Mom used to make Bacon Pancakes in the shape of our initials for our birthdays. I hope to be making Bacon Pancakes with Henry in a few years! 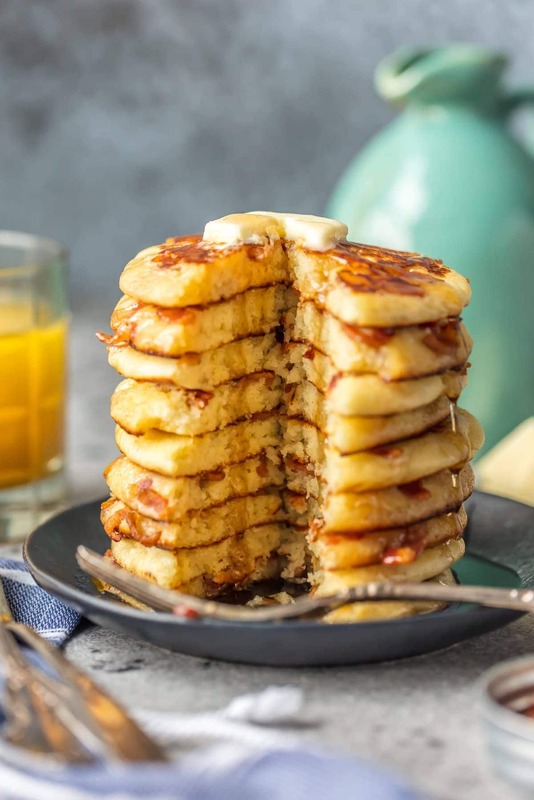 I just LOVE the combo of savory and sweet in these Easy Bacon Pancakes. They’re so simple, but just bursting with flavor. We add a little bit of almond extract to the batter for an extra dose of awesome…my fave part. Pour on the syrup and you’re really in business. Simple flavors are my favorite, and I just can’t get enough of these! Bacon Pancakes are loved by kids and adults alike. The perfect kid friendly recipe! I’m so grateful for my childhood trip across America/Canada and also grateful that we got found out about these awesome Bacon Pancakes for life! 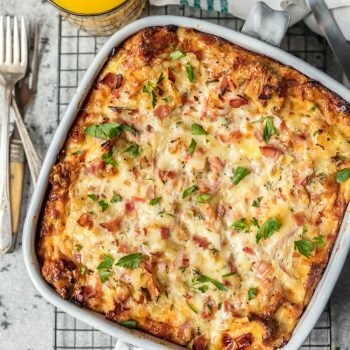 My go-to easy breakfast in a pinch. They’re also easy to freeze for eating later. Make a bunch! Traveling can sometimes show us the best foods while creating the best memories. 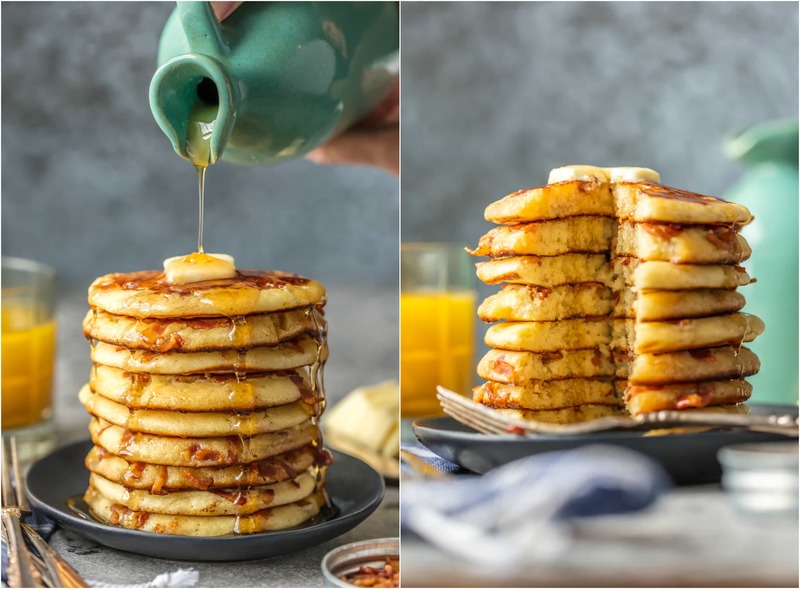 Pair these Bacon Pancakes with our Glowing Skin Smoothie or Easy Mango Smoothie for an amazing and well rounded breakfast with the family. You can also check out all of our breakfast recipes for the ultimate day makers. Throw a Homemade Iced Coffee in the mix if you really want to have a great day. See the recipe card below for full details on How to Make Bacon Pancakes. Enjoy! 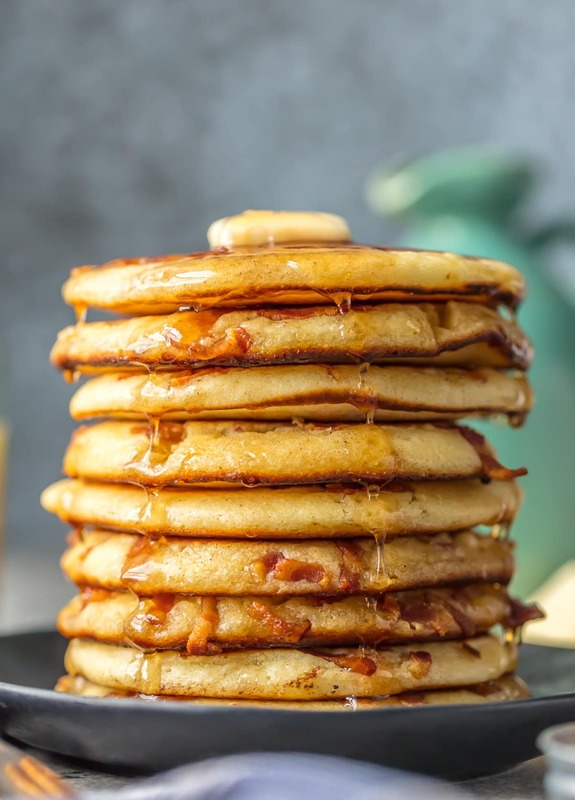 BACON PANCAKES have been a family favorite for years! We first had these savory pancakes and baconbits at the Calgary Stampede in Canada and have been making them ever since. If you’ve been thinking about making Bacon Pancakes, today is the day! It’s our favorite easy breakfast recipe. The savory/sweet combo just can’t be beat! Preheat oven to 200 degrees F. Place a cooling rack over a baking sheet to use to keep the cooked pancakes warm. Cut bacon into 1/8 inch pieces and fry until crisp (or to your liking). Transfer crisp bacon to a paper towel-lined plate and set it aside until ready to use. The bacon can be cooked up to 4 days prior to using, but keep the cooked bacon in the refrigerator. Pour the bacon grease in a heatproof dish to cool, then place it, covered, in the fridge to use in other recipes. In a large mixing bowl, combine flour, baking powder, sugar and salt. Set aside. In the bowl of an electric mixer, beat the egg whites until stiff peaks form. Gently transfer the beaten egg whites to another large bowl and set them aside until ready to use. In the same mixing bowl, combine egg yolks, milk, melted butter, vanilla, and almond extract. Mix until fully incorporated – about 2 minutes. Add the flour mixture to the egg yolk mixture and stir just until all flour is wet. The batter will be lumpy. Gently fold half of the beaten egg whites into the batter. Now, fold in the remaining half of the beaten egg whites. The egg whites should NOT be fully incorporated into the batter. Heat a griddle until hot and add 1-tablespoon butter. Pour 2 tablespoons batter, per pancake, onto the griddle. The griddle should hold 4 pancakes at one time. Sprinkle cooked bacon pieces over the pancakes while the batter is still raw. When bubbles form on the top of the pancakes (about 2 minutes), check the undersides to see if they are golden brown. 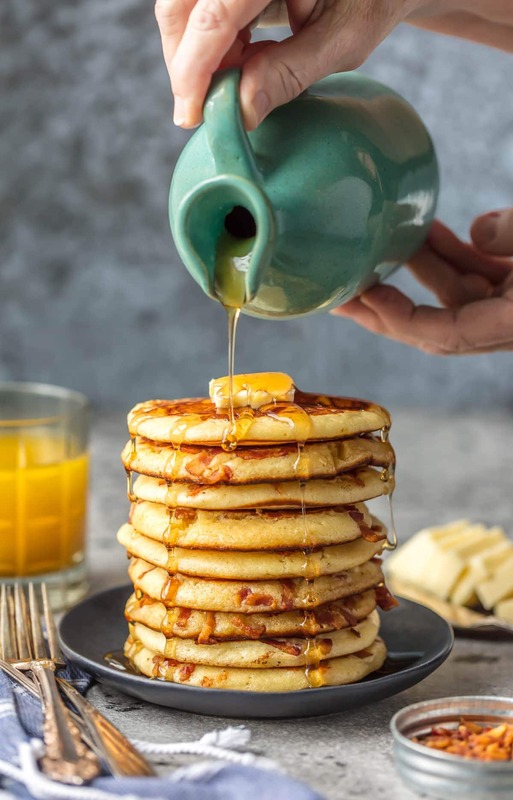 If ready, flip the pancakes over (*Do NOT flip the pancakes over until the tops have bubbles) and continue cooking about 1-2 minutes or until the pancakes are cooked through. Transfer pancakes to the prepared cooling rack and place then in the oven to keep warm. Repeat the process, adding extra butter, for cooking, when needed, until all pancakes have been cooked. Enjoy the best pancakes in the world! 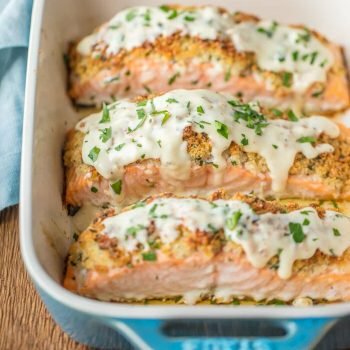 This recipe makes me so happy! I live in California, but I grew up in Calgary. I can’t wait to make these for my kids and give them a taste of my old hometown. Definitely going to make these wonderful pancakes. Please can you tell me how you freeze them.